Title photo: 'Coming Home', a painting by Don Breckon. It depicts NG142, A2-H, of 'C' Flight, 514 Sqn., returning from an operation in 1944. NG142 completed 57 ops and survived the war, despite being hit by flak on four separate sorties. Image by kind permission of Mrs. Meg Breckon. Welcome to the website for 514 Squadron RAF. The information and photographs on the site are the result of research and information supplied by many people with a connection to the squadron including veterans and their families. The purpose of the website is to commemorate all who served in 514 Squadron, Royal Air Force Bomber Command, between September 1943 and August 1945. It is through the sharing of information, photographs and other records that the memory will be preserved of those who fought for our freedom, some 435 of whom paid with their lives. 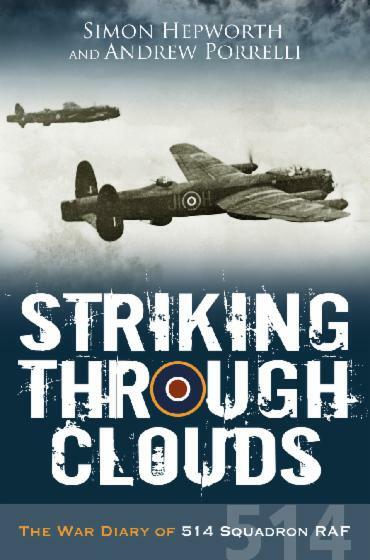 Published in May 2014, Striking Through Clouds is the only comprehensive history of 514 Sqn. Drawn from the squadron's official Operational Record Book, Striking Through Clouds covers the entire life of the unit from its formation in September 1943 to disbanding in August 1945. Every raid is documented with the contemporaneous summary and combat reports with night fighters. Details are given of the losses of all aircraft and crew, along with a researched explanation of the circumstances. With a foreword by Flight Lieutenant Alex Campbell RCAF, DFC, the book brings to life the efforts and travails of 514 Sqn and its members. For other books about 514 Squadron, Bomber Command and related topics please visit our bookstore. For more books featuring 514 Squadron, Bomber Command and the Avro Lancaster, visit the 514 Squadron Bookshop. In 1943, 3 Group had fallen behind some of the other groups, primarily operating the obsolescent Short Stirling heavy bomber compared with the later models of the Handley Page Halifax and, of course, the Avro Lancaster which equipped the rest of Bomber Command. Along with 115 Sqn, already in existence, 514 Sqn was equipped with Mk.II Lancasters, the aircraft being powered by four 1650hp Bristol Hercules radial engines rather than the iconic Rolls-Royce Merlin. The rationale behind the modification of the Lancaster was a concern in 1942 / 43 that there might be a shortage of the Merlins. Some 300 Lancaster airframes were equipped with the air-cooled Hercules; 67 such aircraft passed through 514 Sqn’s hands with 59 being lost through enemy action or accident before the type was withdrawn in September 1944. With an operational strength of thirty aircraft, the squadron’s fleet was to be lost, along with the crews, nearly twice over in the next eleven months with a total of eighty aircraft destroyed or written off by the end of the war. 3 Group itself was moving towards specialisation in blind bombing techniques, in an attempt to improve the concentration of bombs on specific targets. Cloud cover being a regular feature over targets in Northern Europe, a means was needed to ensure that this did not result in wasted effort. The requirement had resulted, by 1943, in the wider use of H2S radar and the Gee navigation system. Both systems had their known shortcomings; H2S could distinguish only certain specific features of the ground beneath the aircraft, whilst its signals could be detected and tracked by enemy night fighters. Gee, based on a number of radio transmitters in England, was limited by the Earth's curvature and was susceptible to jamming. Towards the end of 1943, a new location system was being trialed. With an accuracy of 150 feet at 300 miles range from a transmitter in England, Gee-H could effectively place an aircraft over a relatively small target, such as a large factory, an oil plant or railway yard. The system did not require the bomb aimer to see either the target or markers, and so bombing through ten-tenths cloud cover with sufficient accuracy to hit a high-value target was feasible. The system could handle, in theory, up to 100 aircraft at the same time, though in practice rarely more than 70 would use it simultaneously. By late 1943 this would constitute a relatively small force however, so the ‘GH Leader’ tactic evolved. This entailed a GH-equipped aircraft bombing when its receiver said it was over the target; up to four other aircraft would formate on the leader, releasing their own weapons when they saw bombs falling from the leader. The system really came into its own when the Allies enjoyed sufficient air superiority to allow Bomber Command to attack in daylight as well as at night. Having developed the GH tactics to a degree that impressive results were regularly being achieved, 3 Group was allowed the latitude to operate independently of other Bomber Command groups when required, although the group’s aircraft participated in major raids until the end of hostilities. 514 Sqn was born on 1st September 1943, though the Adjutant was the first member of its staff to arrive at RAF Foulsham in Norfolk on 6th September. Five days later the squadron’s first Lancaster Mk.II, DS735, arrived. Nearly two months’ hard work led to the squadron making its operational debut, to the Mannesheim Works at Düsseldorf, on a raid to trial GH bombing on November 3rd 1943. 514 Squadron was thus fully operational by the start of the winter-long Battle of Berlin, which started in earnest on 18th November 1943. The sixteen operations in which 514 Sqn took part cost seven aircraft through enemy action along with another which over-ran the runway on its return, fortunately without casualties on that occasion. Midway through November 1943, 514 Sqn received orders to move from its Norfolk base to RAF Waterbeach, four miles north of Cambridge, where it remained for the rest of its existence. The move was shrouded in secrecy, the official reason being that the runway needed resurfacing. The truth was that RAF Foulsham had been transferred to 100 Group, whose aircraft operated counter-measures against German defences. The movement was organised and carried out in just over a week. Three of the squadron’s aircraft travelled from Foulsham to Waterbeach via Berlin, carrying out a bombing raid en route. The crew’s kit, including bicycles, was stowed on board for the trip. The strength of the squadron was soon increased to three flights of ten aircraft. 514 Squadron aircraft bore two means of identification; the serial number, unique to each aircraft and which stayed with it permanently along with the squadron code, which was often changed, particularly when individual aircraft were transferred between Flights. This was in the form JI- followed by a single letter (for aircraft of ‘A’ and ‘B’ flights) and A2- (for ‘C’ Flight). The ORB usually shortened this to the single letter itself, e.g. JI-B was shortened to ‘B’ whilst A2-B was shortened to ‘B2’. ‘A’ Flight used the codes JI-A to JI-K (omitting JI-I), ‘B’ Flight JI-L to JI-U and ‘C’ Flight A2-B to A2-L (again omitting A2-I). It has been suggested that this was to confuse German Intelligence. Each flight was commanded by a Squadron Leader, these changing periodically as the individual officer reached the end of his tour, was transferred elsewhere or, in the sad case of S/Ldr Ernest Sly, lost on operations. A decorated veteran of previous tours, S/Ldr Sly was the highest-ranking officer lost by 514 Squadron on ops. Survival was partly a matter of skill, but mostly of luck, as demonstrated by the loss of the highly experienced and decorated S/Ldr Sly on the same operation as the crew of Flight Sergeant PE Mason, on their first op. One pilot, continually riding his luck, was Flying Officer Lou Greenburgh. F/O Greenburgh ditched his aircraft in the North Sea at the end of December 1943, his crew surviving to tell the tale. On another raid, two of his crew baled out of their out-of-control Lancaster before F/O Greenburgh regained control and made a safe return to England. Undeterred, F/O Greenburgh returned again to ops and was shot down again in June 1944, with the loss of his Wireless Operator and the capture of his gunners and Flight Engineer. The intrepid F/O Greenburgh evaded capture, and having had his aircraft shot down twice and damaged twice in 22 operations, survived the war. As winter wore on, the emphasis of Bomber Command’s operations switched from Berlin to targets linked to aircraft production, this becoming predominant from mid-February 1944 onwards. Following 'Big Week', the combined RAF / US Eighth Air Force assault on aircraft production, a brief return to Berlin was followed by sporadic attacks against other German cities. In early spring, the strategy of Bomber Command moved from destroying the industrial infrastructure to paving the way for the Allied landings on D-Day. This played to the strength of GH-equipped squadrons, targets being smaller and, being in the territory of our occupied allies, requiring precision if friendly casualties were to be avoided. Through April and May most such ops were against the railway infrastructure in Occupied France, primarily marshalling yards and repair depots. The targeting of maintenance facilities was to ensure that the rail network could no longer be easily patched up after the final raids before D-Day itself. German officials commented after the war that crippling the railway network had been the most significant factor in preventing German forces from fighting off the Allied invasion. The Luftwaffe, recognising the switch in focus from Germany to more tactical targets in France, lost no time in moving its night fighters in response. This resulted in continuing losses to the squadron's aircraft and crews, though greater support was available on the ground to aircrew who managed to escape from their crippled Lancasters, including the irrepressible F/O Greenburgh, shot down over France in June 1944. As D-Day approached, a variety of targets offered themselves, particularly coastal gun batteries posing a very real threat to the invasion fleet. Most of these were in the Pas de Calais area. These attacks also supported the intention to deceive the Germans into believing that the imminent invasion would be in that location, rather than on the Normandy beaches. Bomber Command had, by now, demonstrated its capabilities as a tactical force, capable of the precision bombing of entrenched German forces even whilst in close proximity to Allied troops. There were occasional, nonetheless tragic, errors; a number of Canadian ground troops were killed by bombs when they had, for an unknown reason, used yellow flares which were confused with target indicators of the same colour, in use that day. Civilian casualties were also, regrettably, inevitable though these were much lower than might have been anticipated. With air supremacy established over the Normandy bridgehead, and most targets within range of supporting fighter cover, Bomber Command was now able to operate over France by day as well as night. The flexibility of the bomber force was admirably shown when, for six weeks in July and August 1944, the South East of England was menaced by V1 and V2 flying bombs. An intensive campaign to eradicate the construction sites and storage depots was effective in eradicating the threat. Other targets at this time included the German E-Boat light naval strike force at Le Havre, which was decimated in a spectacularly successful attack, in which 514 Sqn played a full part, whilst other raids were made against beleaguered German forces dug into fortified defences in the Channel Ports, particularly Boulogne and Calais.Northern France having been secured by the Allies, the next campaign for Bomber Command was 'The Oil Plan', targeting German oil production and storage. Whilst Air Chief Marshal Sir Arthur Harris, Air Officer Commander in Chief of Bomber Command, famously had little time for 'panacea' targets, he did accept that the continuing availability and supply of fuel was of fundamental importance to the German war effort, and to the Luftwaffe in particular. Attacking the transport infrastructure in Germany went hand-in-glove with attempts to destroy fuel storage and, especially, the synthetic oil production facilities. Naturally these were vigorously defended, most notably the Rhein-Preussen facility at Meerbeck, Homberg, where an attack on July 20th 1944 saw four of the squadron's aircraft lost. 514 Sqn would ultimately lose as many Lancasters attacking that single facility as it did during the sixteen raids the squadron conducted against Berlin. As the war approached its conclusion, operations continued against oil facilities, as well as communications lines and troop concentrations as the Allied ground forces moved towards, and eventually into, Germany itself. The squadron took part in the controversial raid on Dresden, this being seen at the time as a routine operation to a communications target. In the prevailing circumstance of total war, morals and ethics could not be a key concern for the squadron as an organisation. It must never be forgotten that this was a fight for national, as well as personal, survival. The atrocities of the Nazi regime, now so clear, mean that the endeavours of the squadron and its crews were never anything less than absolutely necessary. The war's end meant a few short months of more rewarding activity for 514 Sqn. Operation Manna, the dropping of desperately needed food parcels for the Dutch, was followed by a long series of flights to collect prisoners of war from France and Italy. Tragedy was still not finished with the squadron when a Lancaster carrying 24 POWs and six crew crashed on leaving Juvincourt in France with the loss of all on board. In the course of its two-year operational life, 514 Sqn flew 3675 sorties on 218 bombing raids, in the course of which it dropped 14,650 tons of bombs. A further four mining operations were also undertaken, with 70 sea mines being dropped. 426 aircrew and nine ground crew lost their lives whilst serving with the squadron. 66 Lancasters were lost on operations with a further fourteen crashing either on ops or local flying. Twelve were brought down by flak, 38 by night fighters (other unaccounted losses are considered as most likely to have been shot down by night fighters, due to intense enemy activity on the occasion in question), one collided with another aircraft, and at least three were brought down by bombs from higher-flying aircraft whilst six were lost without trace. Of these it is possible that two 514 Sqn aircraft collided over the North Sea whilst en route to or from Leipzig, and another aircraft possibly collided with another squadron’s Lancaster which crashed near Caen. None of these aircraft ever having been found, it is impossible to know for certain. Whilst most losses occurred singly, it was inevitable that some raids saw heavier losses, Magdeburg and Leipzig costing three Lancasters each, an ill-starred trip to Homberg four aircraft whilst the worst occasion was the attack on Nuremberg. The raid on the night of 29th / 30th March 1944 saw four Lancasters from 514 Sqn shot down by night fighters whilst a further two crash landed on their return. The night was the bloodiest of Bomber Command's entire war, as well as 514 Sqn's worst raid. On 22nd August 1945, the ORB simply noted '514 Squadron disbanded'. The written record suggests no fanfare or fuss to mark the end of the two-year life of the unit. There was a Farewell Dinner in the Officers’ Mess, and on that note 514 Squadron passed into history.